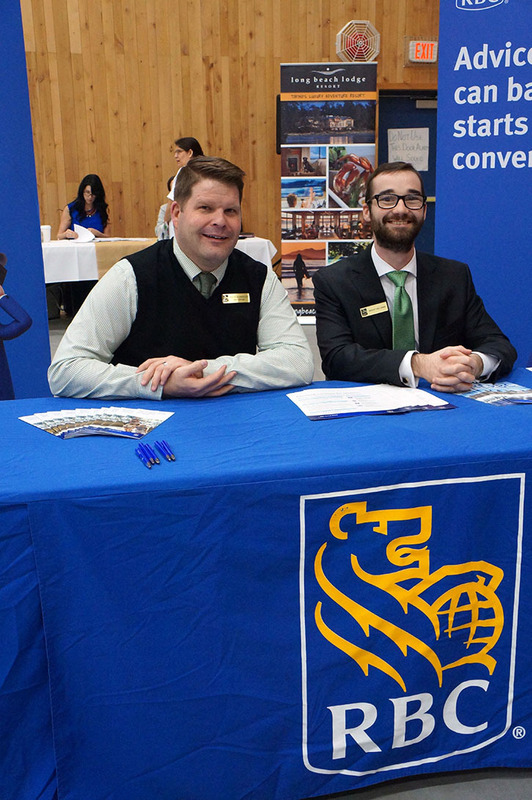 Close to 48 exhibitors were in attendance at the third annual Nuu-chah-nulth Employment and Training Program's career fair on March 17. Mar. 19, 2016 6:00 p.m. The third annual Nuu-chah-nulth Employment and Training Program (NETP) career fair was held on thursday, March 17 at the Alberni Athletic Hall. Close to 48 exhibitors set up booths throughout the hall to provide career training information and employment advice. Among the exhibitors were the Canadian Armed Forces, Royal Bank of Canada, Long Beach Lodge Resort, Canadian Coast Guard, Island Health, RCMP and the Alberni Valley Employment Centre. “We encourage people to bring resumes and I do know that some people are interviewed on the spot but I think it all depends on the organization,” said Shan Ross intake coordinator with the NETP. Guest speakers gave speeches throughout the day, providing information on employment prerequisites and job-training advice. Among the speakers was Harjinder Conway from Catalyst Paper, Deb Steel, editor at the Ha-shilth-sa newspaper, Sheila White from Island Health and Unika Attridge with the Canadian Armed Forces.